A destructive earthquake that struck New Zealand two years ago has left its two main islands edging towards each other, and one city sinking, according to scientists. But the margins are minimal with the gap between the North and South islands narrowing a mere 35 centimetres (13 and a half inches), while Nelson at the top of the South Island has sunk by up to 20 millimetres. The magnitude 7.8 earthquake on November 14 initially pushed the two islands several metres closer and the unsettled fault lines have since nudged the southern landmass further north. However, the gap from Cape Campbell, where the main rupture ended in the South Island, and the New Zealand capital Wellington at the bottom of the North Island is still more than 50 kilometres. At least 25 fault lines ruptured in the 2016 quake, which earthquake geologist Rob Langridge from the government's geoscience research organisation GNS Science said made it one of the most complex earthquakes observed anywhere in the world. Fellow GNS scientist Sigrun Hreinsdottir told the Stuff website on Friday that the sheer number of faults made it difficult to distinguish which was responsible for the post-quake creep. "In reality we are having all this creeping going on and the question is, which (fault) is the dominant factor?" Nelson, at the top of the South Island had fractionally slumped. "The whole area is going down maybe 10 to 20 millimetres. It's not a huge amount but it is observable at our sites," she said. GNS principal scientist, Kevin Berryman, said all earthquakes of 7.5 and above are very complex but it was "certainly unusual" for 25 faults to rupture simultaneously. 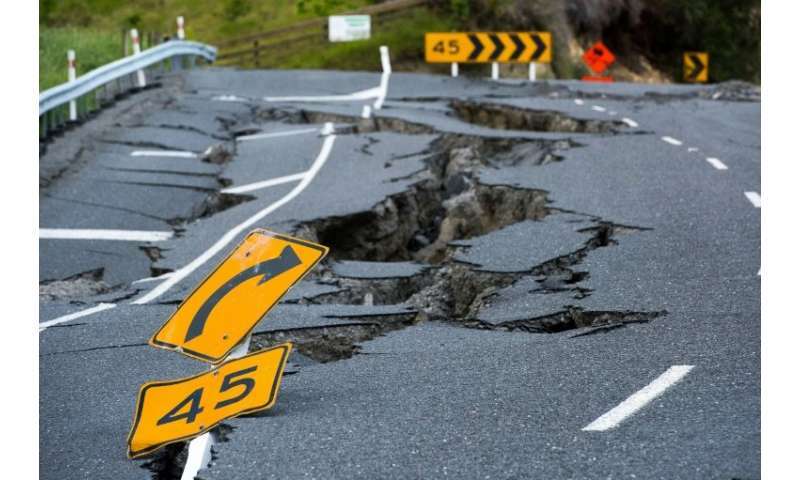 The Kaikoura earthquake struck just after midnight and raced north from the middle of the South Island towards Cook Strait covering 170 kilometres in about 74 seconds. New Zealand lies in the collision zone between the Indo-Australian and Pacific tectonic plates, part of the Pacific Basin Ring of Fire, and experiences more than 15,000 earthquakes a year although only 100–150 are strong enough to be felt. Explain how "35 centimetres (13 and a half inches)", is equal to "several metres closer"?? From the article, and reading between the lines, it seems the initial 'quake shunted the SI several meters north. The 35 cm has presumably occurred since then.